Aidan O'Brien's Orchestra held off Romsdal in a photo finish to give the Ballydoyle maestro another winner in the MBNA Chester Vase. The Ryan Moore-ridden colt appeared set to convincingly claim the Group Three over an extended mile and a half as he breezed into the lead two furlongs out, getting the perfect gap on the rail. But the 3-1 favourite suddenly found himself in a slightly compromising position as the John Gosden-trained Romsdal arrived late and fast under William Buick. Scotland stayed on for third, another eight lengths in arrears. Moore said: "It was a perfect trip but I was on the best horse. "I was trying to be nice to him. He's a lovely horse. He travelled around beautifully. He's a big, strong horse and it's only his third ever run. "The ground was probably a bit too loose for him. They think a bit of the second and third, so hopefully it will be (a strong race)." O'Brien was winning his fifth Chester Vase in the last eight years, including 12 months ago with subsequent Investec Derby hero Ruler Of The World. 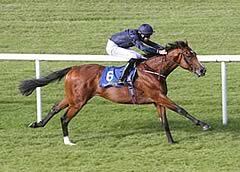 Kevin Buckley , Coolmore's UK representative, said: "We are very, very pleased with that. "He was a bit keen for a little stage, but Ryan got him into a nice rhythm and travelled into the race. Ryan was very happy with the horse. He's a fine, big type of animal and typical of a Galileo. "To do that around Chester, we have to be pleased. It was only his third career start and Aidan was happy with him at home and was looking forward to seeing how he got on here. "Aidan probably left a little bit of work on him, and as I said it was only his third start and we were very happy with way he went around Chester." Betfred cut the winner to 33-1 for the Derby, with BetVictor going 25-1. Coral quoted both Orchestra and Romsdal at 16-1, although the latter would need to be supplemented.